President Trump denied that his order was a "Muslim ban" and pledged "to show compassion to those fleeing oppression"
Dozens of sign-wielding City University of New York students and staffers from Brooklyn Borough Hall rallied Monday in support of a graduate student detained abroad because of President Trump's immigration order. "Unify and defy," the 50 or so protesters outside the Cadman Plaza federal courthouse chanted. "No hate, no fear, immigrants are welcome here." Others held signs with three simple words in capital letters: "LET HER IN." "Her" is Saira Rafiee, a doctoral student enrolled at the CUNY Graduate Center through an F1 visa who spent winter break visiting family members in her native Iran, one of the seven countries affected by Trump's 90-day travel ban. 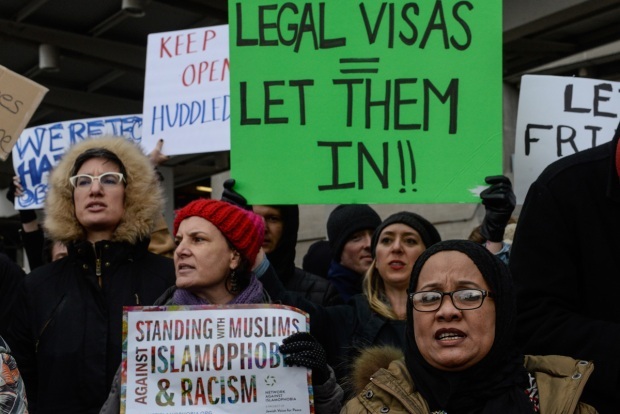 Rafiee was trying to return to New York, to school, when customs officers in Abu Dhabi told her she couldn't go back because of the president's executive order. "I had to stay there for nearly 18 hours, along with 11 other Iranians, before getting on the flight back to Tehran," Rafiee wrote on Facebook. She was able to fly back to Tehran, but remains barred from reentry to the U.S.
"I have no clue whether I would ever be able to go back to the school I like so much, or to see my dear friends there," Rafiee wrote. "But my story isn’t as painful and terrifying as many other stories I have heard these days." Rafiee, who lives in Prospect-Lefferts Gardens, wrote about one Iranian student in the U.S. who was supposed to go home to see her cancer-stricken sister who had to cancel her trip because of the order. Rafiee wrote of a Columbia Ph.D. student who went to Canada for the weekend to spend time with his fiancee and was refused reentry to America. "I know many students who are outside the US, doing fieldwork for their dissertation, and have no clue whether they can finish their studies after studying for many years," Rafiee wrote. "And these stories are not even close in painfulness and horror to those of the people who are fleeing war and disastrous situations in their home countries." "The sufferings of all of us are just one side of this horrendous order," the Facebook post continued. "The other side is the struggle against racism and fascism, against assaults on freedom and human dignity, against all the values that even though are far from being realized, are the only things that would make life worth living." Rafiee is one of about 120 students from the ban-affected countries enrolled in the CUNY system. In addition to the 90-day travel ban, Trump's executive order indefinitely bars Syrian refugees from entering the country. "We are organizing to dismantle this shortsighted sloppy form of government," Hercules Rees, president of the CUNY student body, said at the rally for Rafiee. In a statement Monday, CUNY, as is the case with many other schools, said it was recommending immigrant and non-immigrant students, faculty and staff from the seven affected countries avoid travel outside the U.S.
"Though the Department of Homeland Security has announced that permanent residents from the seven countries will not be barred reentry, we think it prudent for permanent residents to avoid travel until the issues surrounding enforcement of the order are clarified," the statement said. Rafiee took harsher tones in her Facebook post. "It is time to call things by their true names; this is Islamophobia, racism, fascism," Rafiee wrote. "This is a fight for all of us, and I am sure the people, united, will never be defeated." 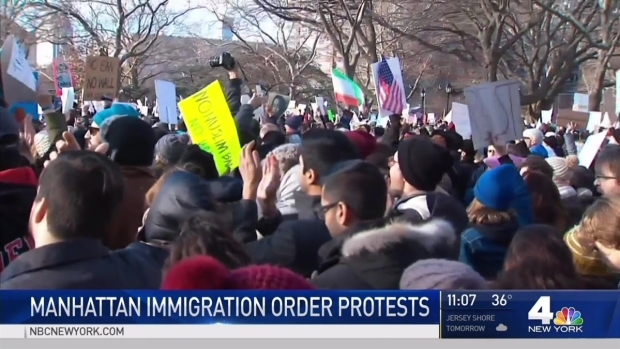 Tens of thousands demonstrated against the order over the weekend as travelers were detained at John F. Kennedy Airport and other airports across the country in accordance with the ban, which local leaders, celebrities and private citizens have denounced as un-American and oppressive. Among other local people who can't get back home is a Long Island man who was visiting his sick mother in Saudi Arabia. Abdulelah Othman lives in Selden with his wife, but is not allowed back because he is a citizen of Yemen, one of the seven countries under the temporary travel ban, despite the fact that he has a green card. 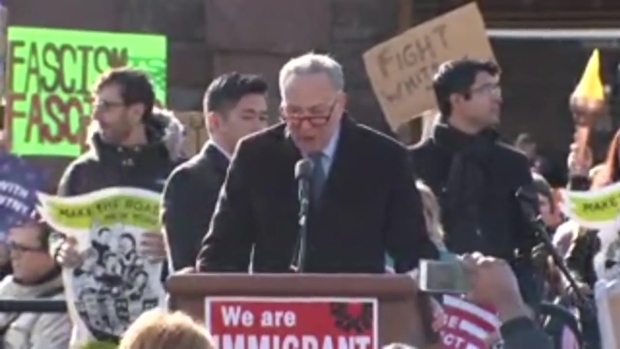 Senate Democratic leader Chuck Schumer, who was among those firing up crowds at weekend rallies in New York, pledged Monday to try to get a vote to repeal Trump's order on the Senate floor. He called the ban "appalling," though his effort to get a vote on the matter Monday will prove challenging. About an hour before Schumer announced his intentions on "Today," Trump tweeted that only 109 of 325,000 people "were detained and held for questioning" following his executive order. He said "big problems" were created at airports by a Delta Airlines computer outage, "protesters and the tears of Senator Schumer."